In a world full of smart devices, it can be hard to decide which is the “right one” to buy. 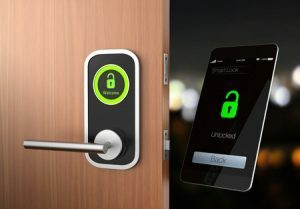 Among the many smart devices on the market are smart door locks. If you are in the market for smart home security, here are four solid choices from the list of top smart door locks on Amazon. We will show how they compare and which is the best (in our opinion) based on features and on value. So… when searching “smart door locks” on Amazon, this one actually popped up at the top even though it functions using a key pad. We still think it’s a ‘smart’ choice though and are keeping it in this top 4 list. Summary of top positive reviews: Very secure locking system. Summary of top critical reviews: Newer models may not be as high-quality as the original. Summary of top positive reviews: You can use an Amazon-connected device as the hub, so if you already have an Echo device or the like, this is the best option for an Amazon household. Summary of top critical reviews: Setting up the Schlage Sense App may be confusing. Summary of top positive reviews: Easy to set up and very secure locking system. Summary of top critical reviews: May be a frustrating process to program and reset. Amazon price: This is the only one on this list that distributes from multiple sellers, and the price varies by the seller. The lowest price is around 150. For a brand new product, you’ll pay $225+. Summary of top positive reviews: Easy to install, works well, looks and feels high quality. Summary of top critical reviews: Condensation build-up may damage the product, making it unusable. Based on features alone, the Schlage Connect Smart Deadbolt would be a great choice. When it comes to full value, which considers price and features, we suggest the Schlage Camelot Keypad Deadbolt.